Welcome to the National Museum of American History! The museum is open every day except December 25. Admission is free. Information posted here is subject to change. Please check back for the latest status. No announcements at this time. Every year, groups from around the country come to Washington, D.C. to participate in events and activities. We welcome everyone to explore the museum, and we have restrooms, water fountains, and dining facilities available if needed. Please note that all visitors must go through a brief security screening at the entrance. For groups participating in First Amendment activities, please note that the Smithsonian does not allow visitors to bring signs or banners into the building. You can check out our visit tips and security policies for more detailed information, and if you have additional questions, please contact us via the Contact Us link at the bottom of this page. Start your visit at our information desks located near the entrances to help you plan your day at the museum. Here you can find out what programs are happening that day or pick up a map. 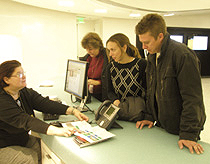 If you have a specific question or need assistance, ask one of our friendly visitor services staff. Free self-guides are available below to download in .pdf format. Selected guides are also available for pickup at the information desks. PLEASE NOTE: Items may have been moved or taken off display. Please ask at the information desk if you need assistance. Discover stories celebrating women. Guides available in English and en Español. A general museum tour for adults, lasting about an hour, guides visitors to 26 stops throughout all three floors. Also available in Spanish and Mandarin. A preschool tour of the first floor is also designed for multi-generational groups to take together, and includes a fun interactive element at each stop. A guided tour through our new exhibits about The Nation We Build Together, located on 2 West, offers colorful narration from our curators and other thought leaders including Madeleine Albright and Colin Powell. Also available in Spanish. From interactive carts to spotlight tours, there are experiences for you to encounter every day. Visit the Star-Spangled Banner, the flag that inspired the national anthem. Other exciting displays feature diverse topics from technology to politics to popular culture. Draper Spark!Lab and Wegmans Wonderplace are great spaces for young learners. Note that these spaces are open 10:00 a.m. to 4:00 p.m. and closed on Tuesdays. We offer an exciting array of programs and materials. All visitors should be prepared for a security check upon entrance to the museum. Please note there may be a line to enter the building on busy days. To learn more and see a list of prohibited items and other museum policies, follow the link below. Some areas of the museum are closed due to the ongoing renovation of our west exhibition wing, and some popular objects may be off display. Use the links below to check on the latest information. On the National Mall, Constitution Avenue, N.W., between 12th and 14th Streets, Washington, D.C. Visitors may be filmed, photographed, or recorded by the Smithsonian for educational and promotional uses, including for posting on the Smithsonian's and other public Web sites. Try the self-guides linked from this page, and visit our Kids page for more ideas on things to do at the museum.